Home/Uncategorized/WSOP Main Event Hand Analysis: To Fold KK or not to Fold KK? 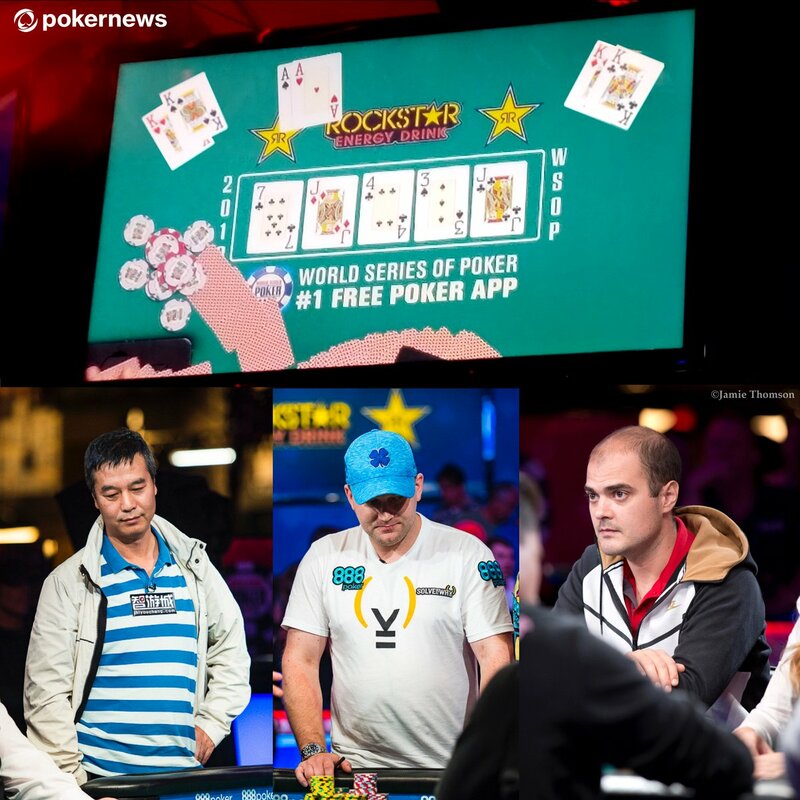 The WSOP Main Event always provides intriguing hands that generate considerable discussion. In 2017, Vanessa Selbst nearly got away from an Aces full of 7s boat on Day 1. Selbst correctly assessed that Gaelle Baumann had quads, identifying the only other possible holding as A7 of hearts. Selbst struggled for a while, wanting to find a fold. Most of us would have snap called. Selbst eventually succumbed, but gave considerable thought to folding. This brings us to the final table bubble hand in the 2018 Main Event. Many observers have expressed strong opinions about this hand. But for anyone who is not aware of it, let’s review what happened. You can also watch the hand here. Nick Manion (4th largest stack of the 10 remaining players, about 72BBs), opens UTG for 2.5x holding AsAh. It’s folded around to Antoine Labat (2nd largest stack, about 85BBs) in middle position who cold calls with KdKc (more on that later). Immediately after Labat is Yueqi Zhu (7th largest stack, about 41BBs) who wakes up with KsKh. In under 20 seconds, Zhu shoves. It is folded back to Manion. In under 10 seconds, he shoves over the top all-in. Back to Labat, who takes slightly over a minute before he calls and sees the bad news. Labat is virtually drawing dead save 4-straight or 4-flush possibilities. ESPN analysts Maria Ho and Norman Chad quickly framed the future debate. As Labat pondered following Manion’s shove, Ho commented that although it feels like you can’t get away from KK “you can.” Chad tersely responded “you can not.” Before getting into hand ranges and equity, you have to ask the global question: can you fold KK in tournament poker, ever? Your response may rely on where you fall on the risk spectrum. I tend to be more risk-averse in tournaments than is optimal. Even in lower stakes tournaments I have folded KK pre-flop to all-in 4-bets. When staring at a player who has the excited and compassionate “you-better-fold-buddy” look, it’s hard not to think AA. But then I play against recreational players whose range in these situations is basically two hands. The basic question “How can you ever fold KK pre-flop?” is a challenge for all players, whether recreational or professional. Perhaps a minor, yet curious, aspect of this hand is Labat’s original flat of Manion’s 2.5x UTG raise. My initial reaction was shock. The KK flat to an UTG open is just hard to wrap my mind around. Trapping seems to be the intent, but the ceding of information that a 3-bet would have provided seems a bigger loss. The flat in middle position (assuming no 3-bet) also invites in other callers with speculative hands. The BB, at minimum, is calling with a very wide range. This weakens your equity at a time you do not want to be giving it away. More importantly, if Labat had 3-bet would he more accurately have interpreted Manion’s 5-bet? When you hold KK blockers, it would be hard to put Manion on much other than AA with a 5-bet. What does Manion put his opponents on? This gets a bit tricky. Labat likely assumes, given his cold call, that neither Zhu nor Manion is worried about him, even if they have weaker holdings than AA and KK. 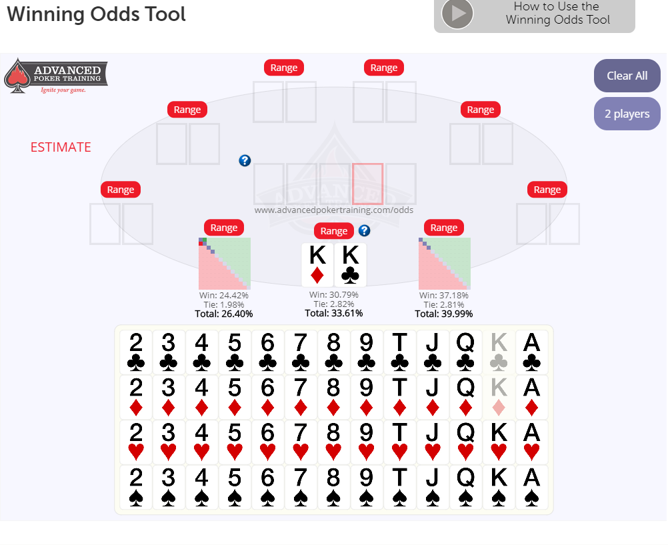 Using the APT Winning Odds calculator, let’s give Zhu a range of JJ to AA and AK (suited and unsuited). For Manion let’s consider the stronger range of QQ to AA. Labat has about 33.6% odds to win the hand (including ties). However, if you take the JJ and AK hands out of Zhu’s range, Labat’s odds drop to 23%. If you further restrict both opponents’ holdings to just AA and KK, Labat’s equity plummets to about 8%. Labat would be praying both have AA (allowing 20% equity). His actual predicament drops his equity to under 3%. Basically, Labat had to be very optimistic to think he would come out of this hand unscathed. With Zhu only having 41 BBs, it’s unclear how strong he is. His shove puts a lot of pressure on two bigger stacks who might be weak. So, Labat may have thought Manion was trying to isolate, unconcerned with Labat’s flat call (and Zhu’s apparent move to pick up the pot). Labat may have factored in that he could take the side pot even if Zhu beats him. There are a lot of considerations here. 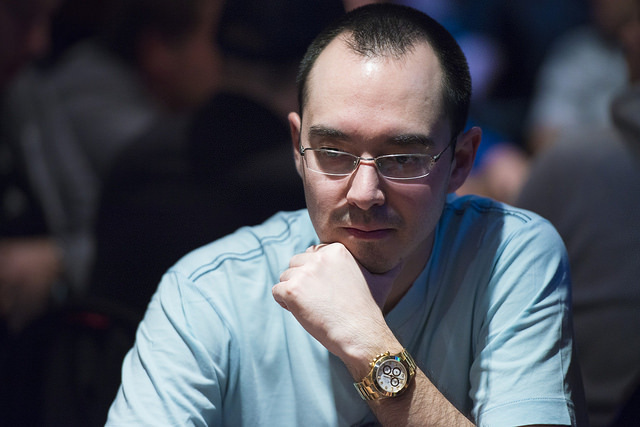 Given his relative stack size, Labat will not “bubble” the official final 9-seated table. Jumping from 10 to 9 increases the payout by $150,000, nothing to sneeze at. However, the relative jumps for players 4 through 10 are relatively minor compared to those in the top four. And Labat was the second biggest stack before this hand. 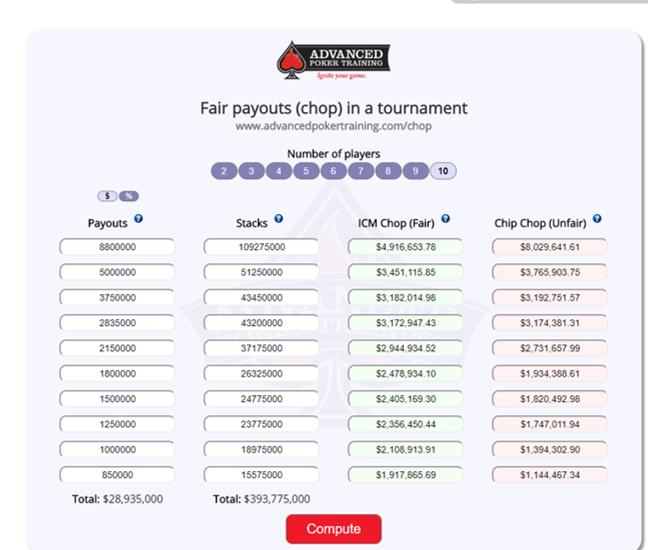 Using APT’s Tournament Chop tool, we see the value of Labat’s stack before the hand is $3.45M (see below). If Labat folded, and Manion won, Labat’s stack value only drops to $3.37M. 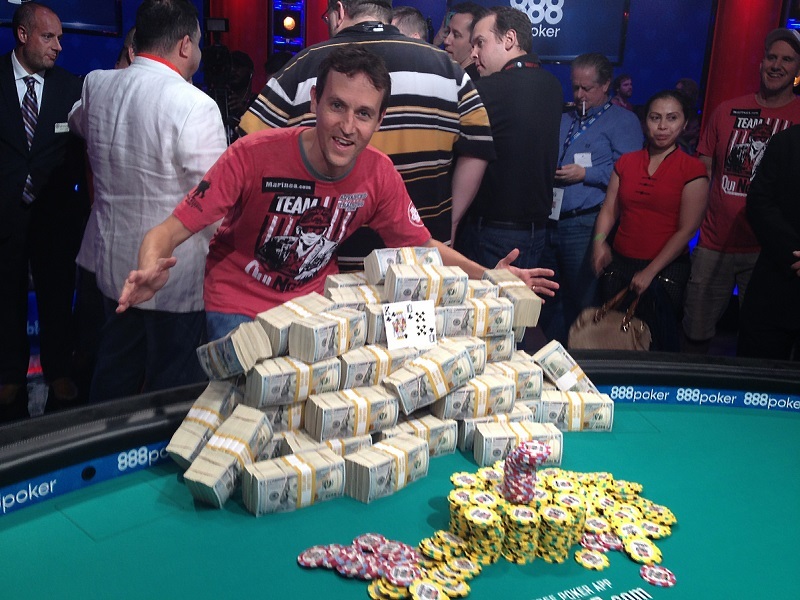 If Labat won, his stack value rises to $5.04M. Losing the hand as he did, his value plummeted to $1.64M. He emerged from the hand with only slightly more than 13BBs. If all 3 outcomes are assumed equally likely (holding the scenario of beating Manion but losing to Zhu aside), his upside of a $1.59M gain in stack value is slightly lower than his downside, a $1.81M drop. But it’s close, and the upside is awfully tempting. Manion had about 84% of Labat’s stack. Manion’s stack size leave’s Labat as the smallest stack if Manion wins the hand. That is probably Labat’s greatest vulnerability: facing off against a stack with the potential to transform him from the second largest stack to the smallest. No one should alter their play because this is the WSOP Main Event. However, everyone is human, and few players at the final table are ready for the glare of the spotlight. To fold KK on national television with the possibility of being wrong may elicit voices in your head screaming “What were you thinking?!”. However, if you call, many would echo Chad’s reaction: “Hard to get away from kings.” How much that played into Labat’s decision, we’ll likely never know. But it would be understandable in this situation that the heat of the moment trumped the pure poker decision. Folding KK seems nearly impossible. Particularly late in a tournament. And it is hard to fault anyone for calling with KK. However, the analysis here indicates that Labat’s folding would have been the proper move. Darryl Fish folded KK to me pre-flop. He had a stack of 110K and I had 60k I open raised. He reraised me and I went all in. We were 5 minutes from bagging. I am in my 70’s. I am sure he looked at me and was thinking “would this guy go all in for his tournament life 5 minutes from bagging if he did not have AA.” I did NOT have AA. I had 99. He won the tournament. Good result for you in the hand and great result for Darryl long-term in the tournament! I had the conversation this weekend about, in tournament play, when a fold may be wise even if likely the wrong fold at the moment. In a small tournament, with 7 players left and 3 getting paid I flopped top pair, decent kicker from big blind, checked and woman who I did not know shoved for 60% of my stack. I knew it was unlikely she had better, but I was one of the biggest stacks and felt good about how this was playing out and wanted to remain able to pick my spot. I folded and she showed one card that made middle pair. Maybe she had more behind but unlikely. I was kicking myself, but went on to chop top 3 so it worked out. But your example, and others like it, are relevant to Labat’s decision. Was risking becoming the small stack worth it to Labat even if he was right? Or is the possibility of emerging as the biggest stack just too tempting? Which was the more critical side to err on? Exactly. Darryl made the correct decision. He and I spoke about it later. He was thinking “I am better than anyone in this field. Why chance half my stack on a coin flip decision?” I learned more about how pros think from that hand than any other single event. I busted out 2 hands later with AK.